The Keys of Great Writing offers great advice about every aspect of the craft, showing you how to develop a writer’s voice that is unique, precise and effective. From grammar to revision strategies, you will find the crucial information you need in short, easy-to-browse sections that enable you to hone your own signature writing approach. The book’s 11 chapters are divided into three parts in addition to the foreword, introduction, five appendices, and the index. In the foreword the author introduces the books, his favorite writing gurus and gives an overview of the book. The introduction deals with style, myths of great writing, self-assessment checklist and the qualities required to become a good writer. The first part—Keys to Great Writing— contains five chapters: Economy, Precision, Action, Music, and Personality. Chapter one (Economy) involves rejecting the notion that more is necessarily better. This chapter deals with various techniques to help ‘every word count.’ It contains 14 techniques to eliminate wordiness. The second chapter (Precision) is about the writer’s command of language and ability to use the right words. It contains guidelines for using the right word, making a definite impression and avoiding common errors in word choice. Chapter three (Action) has to do with making the sentences tell stories. It deals with issues like using action and movement to engage the reader, effective usage of active voice, and working with verbs and nouns. The fourth chapter (Music) is about rhythm and the sound of language. It teaches how to convey the emotions and communicate effectively with the readers. The final chapter of the first section (Personality) is about giving the readers a sense of the person behind the words. It offers sound advice on how to be lively, unpredictable, playful, and genuine. The second part of the book is called Elements of Composition. It contains five chapters—Purpose, Point of view, Organization, Support, and Coherence. Chapter six (Purpose) deals with deciding what to say and how to say it persuasively. Chapter seven (Point of View) helps in deciding how to choose the best point of view to tell your story. The eighth chapter (Organization) deals with developing the project from outline to completion. It also concentrates on how to handle beginnings and endings. Chapter nine (Support) explains how to support the statements, ideas, and assertions with examples, quotes, analogies, and metaphors. The last chapter of this section (Coherence) explains how to maintain the flow and continuity of the thoughts and ideas. Part three of the book (Drafting and Revising) has a single chapter—The Writing Process. This chapter explains how to write using ‘the four-stage process’. It also deals with issues like overcoming the writer’s block, getting started, dealing with long writing projects, etc. Some other topics covered in this chapter are using principles of time management in writing, developing good writing habits, and making a lifetime commitment. The appendices are Glossary of grammatical terms, Keys of great writing checklist, Elements of composition checklist, Proofreading checklist, and Recommended resources and reading. 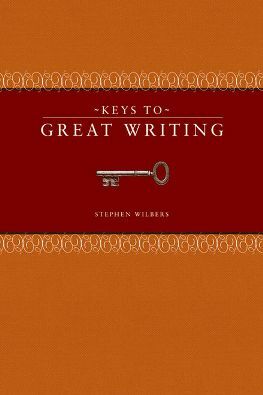 Keys to Great Writing by Stephen Wilbers is a book that every writer should read, read and keep on reading.